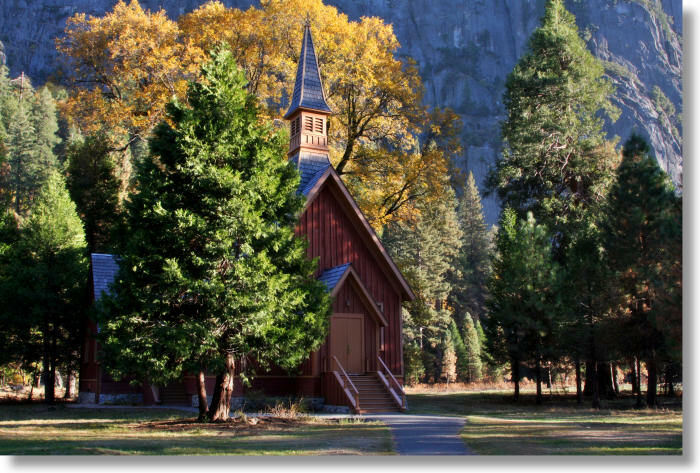 You can think a long time without coming up with an advantage Las Vegas has over Yosemite (especially if that's not what you're thinking about), but here's one: at Yosemite's chapel, walk-up wedding parties aren't accommodated, and there aren't any Elvises on hand to conduct the ceremony, either. Let's hope management sees the light on this one soon. The more couples that get married in Yosemite, the more people will have unshakable sentimental attachments to the park and be willing to donate money and fight for its protection. Perhaps the park's panjandrums think that energy would be better directed to Bernie's Drive-Thru Weddingarium? If you're a notary public, please write to the park and volunteer to spend one day a year conducting weddings in a Smokey the Bear costume. We can make this happen.